The WAAS-certified GNS 530W and its slightly smaller sibling, GNS 430W, lead the industry with multitasking, integrated avionics and cutting-edge WAAS navigation. The standard GNS 530W features a 10-watt comm, and for a slightly higher price, GNS 530AW delivers 16 watts of power output. Both versions come with optional Class B TAWS alerting to warn you of potential terrain and obstacle conflicts along your flight path. GNS 530W is an all-in-one GPS/Nav/Comm solution. 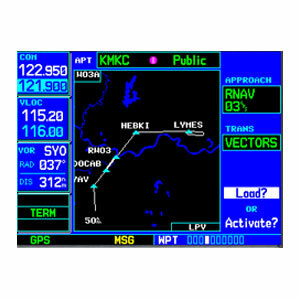 It features a WAAS-certified GPS, 2280-channel capacity comm and 200-channel ILS/VOR with localizer and glideslope. Traditionally it would take a host of components to provide the capabilities of this one smart box. High-speed 5 Hz processing makes navigation calculations and map redraw rates five times faster than earlier GNS series navigators. When installed alongside GTN series avionics, the GNS 430W can automatically receive flight plans from the touchscreen device. The two devices can also share user waypoints back and forth with each other. GNS 530W comes with built-in WAAS navigation capabilities. It is approved to fly LPV “glideslope” approaches without reference to ground-based navaids of any kind. Featuring an advanced 15-channel receiver capable of five position updates per second, GNS 530W meets the FAA's stringent TSO C146a standards for WAAS "sole means" navigation — providing vertical and lateral approach guidance into thousands of U.S. airports previously inaccessible in IFR conditions. 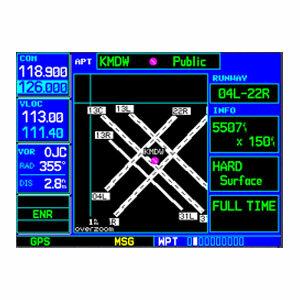 GNS 530W's 5-inch high-contrast display with brilliant colors makes it easy to read and interpret pilot-critical information. Effective use of color makes it easy to see your position relative to ground features, chart data, navaids, flight plan routings, approach procedures and more. Conveniently scan information from wide viewing angles, even in direct sunlight. 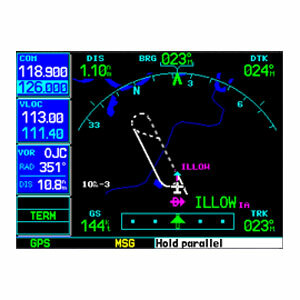 GNS 530W seamlessly integrates built-in terrain and navigation databases, providing a clear, concise picture of where you are and where you’re heading. The 530W's huge Jeppesen® database, updated with front-loading data cards, contains location reference for all airports, VORs, NDBs, Intersections, Flight Service Stations, published approaches, SIDs/STARs, Special Use Airspace and geopolitical boundaries. A detailed basemap shows airports, cities, highways, railroads, rivers, lakes, coastlines and more. Using information from the built-in terrain and U.S. obstacles databases, the 530W displays color coding to graphically alert you when proximity conflicts loom ahead. In addition, you can augment GNS 530W with optional Class-B Terrain Awareness and Warning System (TAWS) for an extra margin of safety in the air. Working in tandem with standard autopilots that accept roll-steering commands, GNS 530W behaves like a high-end flight management system (FMS) and can automatically fly your aircraft through holding patterns, procedure turns and other position-critical IFR flight procedures. GNS 530W is easy to interface with a wide array of optional sensors and tracking systems, allowing you to see and avoid hazards such as threatening weather, lightning or air traffic. With a GDL 88 Datalink, the GNS 530W can display ADS-B traffic targets using TIS-A symbology, as well as subscription-free FIS-B weather information -– including graphical NEXRAD radar, METARs, TAFs and more. An optional subscription to XM WX Satellite Weather™ and the addition of the GDL™ 69 series datalink receiver, you’ll have access to high resolution weather for the U.S., right in the cockpit. Information includes NEXRAD, METARs, TAFs, lightning and more and can be laid directly over Jeppesen and topographic map databases. With an additional monthly service fee, GDL 69A delivers XM Satellite Radio to your aircraft. 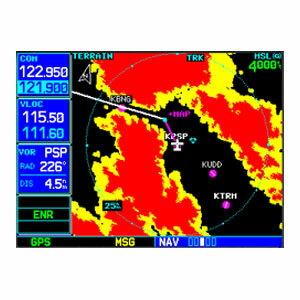 Add the Garmin GTX 330 Mode S transponder, and GNS 530W will also display Traffic Information Services (TIS) alerts that identify surrounding air traffic. 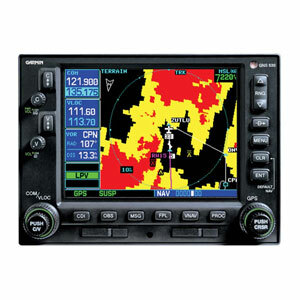 ¹Garmin will stop accepting orders for the GNS 530W on Nov. 30, 2011. While availability will soon come to an end, Garmin will continue supporting the product with repair services and maintenance software releases for the foreseeable future. For customers looking to purchase a GNS product, we encourage you to check out our GTN series, which replaces our GNS products.